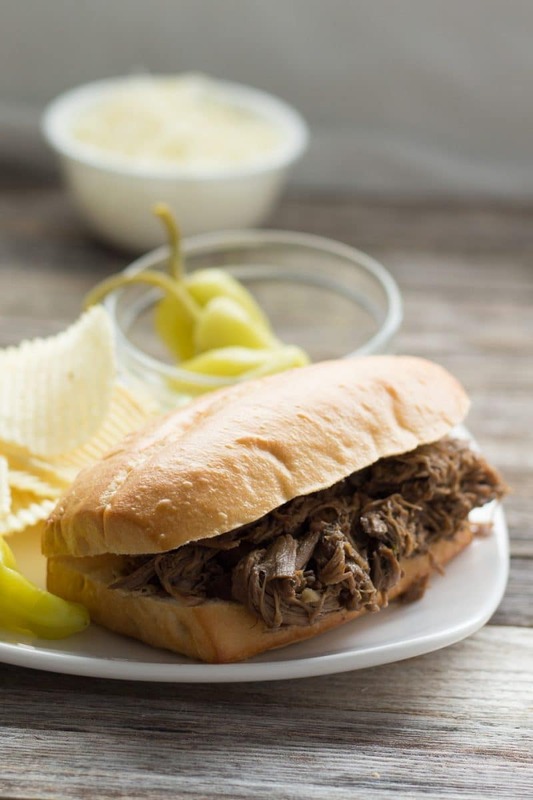 Easy Italian Beef Recipe can be made in a slow cooker, braised in the oven, and even simmered on the stovetop. All the spicy flavors you expect from an Italian beef from the Chicago area. 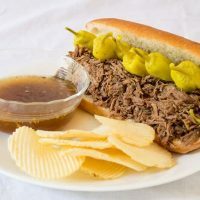 Our Italian Beef recipe gets all of its flavors from spices, pepperoncini are reserved as a condiment. There is no vinegar in a true Chicago Style nor does it have Italian dressing packets added to it either! We call slowly cooked and shredded beef that has been cooked with pepperoncini Mississippi Pot Roast and not Italian Beef where I come from. Authentic Italian beefs are easily accessible at almost every pizza or hot dog place in Chi-Town. You can search high and low outside of that area and never find one. Finding a good Chicago style hot dog is also another challenge. The traditional cut of beef used is a top round roast. If you had a commercial kitchen slicer this would be ideal because you could cut it across the grain to get those tender thin slices you find at Portillo’s and other restaurants. It’s not great for our home method. These are nowhere near an original Italian Beef that can easily be found in that area. Those are made with beef roasts cooked to rare in a flavorful broth, then sliced into thin perfection pieces of meat. The meat is dipped back into that wonderful broth and slapped onto a sturdy Gonnella roll (which are unfortunately only available in and around the Chicago area grocery stores). I’ve tried recipes that called for rare beef, thinly sliced and simmered in broth, but I could never get a kitchen slicer or knife to recreate that perfect tenderness of the original beef in Chicago. So now I used the shredded beef method. It turns out more like an Italian “flavored” shredded beef in a spicy au jus. 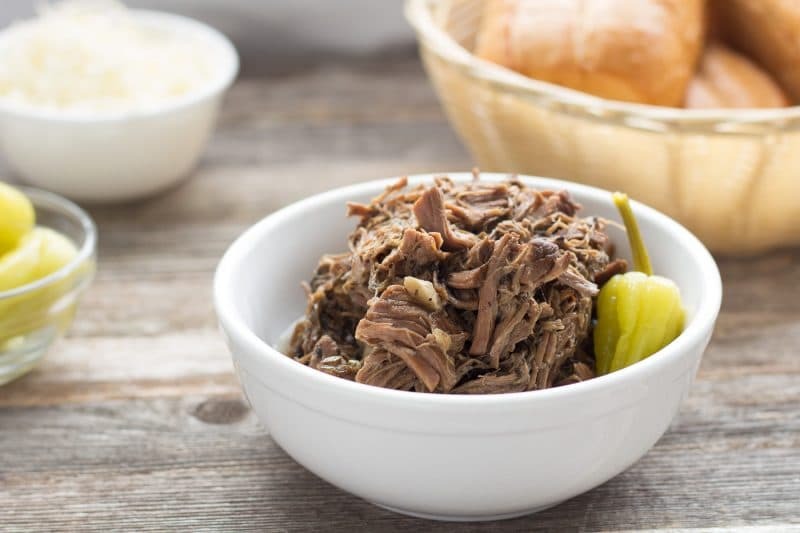 Shredded meat would never appear in an authentic Italian Beef, but unless you have a commercial slicer, slicing beef appropriately as a home cook is almost impossible. I have burned through 2 meat slicers trying! Shredded is not perfect, but it will get the job done and its less work anyway. Chuck roast is probably the roast I use the most for this recipe. It’s relatively cheap as far as beef goes. It holds up well under a long slow simmer and actually needs a long braise to become tender. A chuck roast is also not so thick that it produces really long strings of beef when shredded. Rump roast would be my second choice. This cut also requires a long slow braise to make it tender without the ability to slice it thinly across the grain. This can be an economical choice if you happen to catch it on sale. The only drawback to this cut is that it can be kind of thick. To prevent the beef piece from being too long, I cut it in half after cooking and then shred it. Bottom round roast starts getting into a higher price range. It’s supposed to be slightly more tender that rump roast so they charge more. This is suitable for Italian beef, just not as economical if cooking for a large crowd. Remove the meat from the cooking liquid and allow to cool slightly before attempting to shred the beef. There is going to be some fat and other things that may require hands to get rid of. The meat may start to fall apart as you pull it out of the broth. This is good, it will give you some idea of which direction to shred it. On a cutting board or another plate, add a section of cooked beef and start to pull it apart. Don’t shred it too finely though, it will continue to fall apart after it is added back to the cooking liquid! 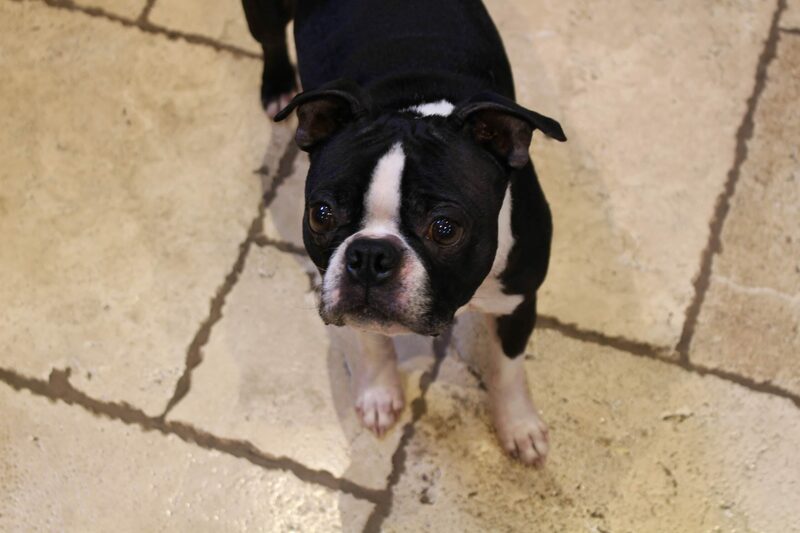 As big chunks of fat or sinew turn up, remove them and discard or feed to the dog. Chances are the dog is already up under your feet at this point looking at you with sad eyes. Once all of the beef is shredded, add it back to the cooking liquid and set it to low. It’s called gravy when served with Italian beef, but its really just an au jus. There should be no reason to have to add anything more to the cooking liquid at this point. The gravy was made when the Italian beef was started. Don’t be off-put by the amount of beef broth and base used in the beginning. All that beef flavoring, garlic, and oregano will give great flavor to the beef but the real purpose is to have a good gravy. It can be spoon over the meat on a sandwich and served on the side for dipping. If I were back home, I could easily buy Gonnella Rolls in the store. But I could also easily buy an Italian Beef……….. If you have access to Gonnellas or Turano hard rolls, those are the absolute best for holding wet beef without falling apart so they can be dipped into the au jus! I prefer to serve these with hard rolls, Kaiser rolls, or any sturdier roll is the best bet but in a pinch, any sub roll will do. It is just going to fall apart more readily. Soft sub rolls will do the best if the gravy is served on the side! Most folks just say no to cheese when ordering an Italian beef. We don’t eat ours with cheese. Guests always ask for cheese though whenever I serve these, so offer shredded mozzarella. Don’t use the dusty package stuff for this. Hand shred this from a block of mozzarella. It will melt so much easier. Alternatively, you can use sliced mozzarella. This will require a quick run under a broiler. 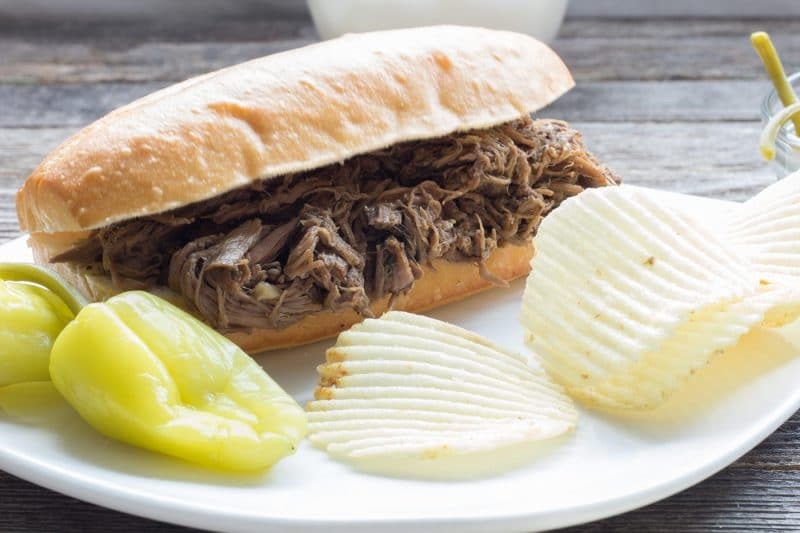 Italian Beef can be served as a sandwich, over mashed potatoes, or even alone for those gluten issues, eating paleo, or on a ketogenic diet. 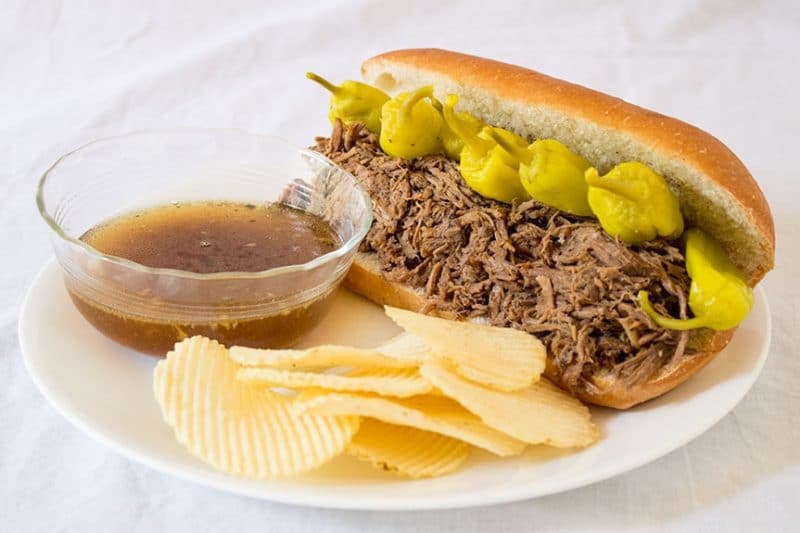 Italian Beef Sandwiches are hardy enough that they can be served alone. We eat them alone when it’s just us in the house. I usually offer up some potato chips and maybe some coleslaw or a broccoli salad when we have guests. Trim roast of any visible silver skin, gristle, and large pieces of fat. Cut small slits all over the meat and insert garlic slivers. Place roast in a roasting pan that has a fitted lid. Cover with oregano, sprinkle with red pepper flakes and pour condensed consommé over the top. Add the bouillon or beef base into the liquid. Add water if necessary to bring the liquid up to the top of the roast. Place lid on the pan, or tightly cover with aluminum foil. Place in preheated oven and slow roast for 3 to 4 hours or until meat is easily shredded with 2 forks. Remove meat from liquid and shred. Place meat back into broth and reheat over low heat if necessary. Use tongs to place meat on sliced hard rolls. Serve with pepperoncini. Add broth to individual small bowls for dipping sandwiches. This recipe can be made in a slow cooker. Cook on high for 5 – 6 hours or low for 8 – 12 hours. Nutritional Data is for Beef only. Ahhhh I can almost feel the juice running down my face now. Okay, that was maybe a little weird. 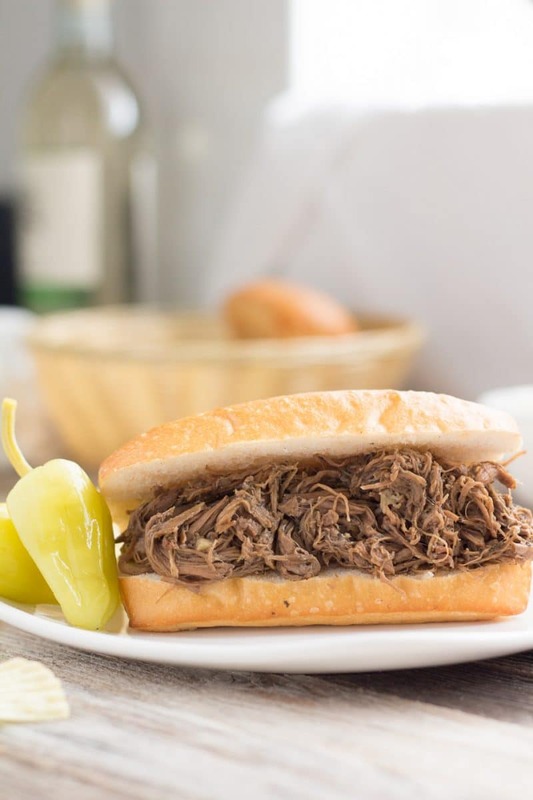 The point being, I’m totally obsessed with this recipe and now I NEED some Italian beef in my life ASAP! Looks delish!